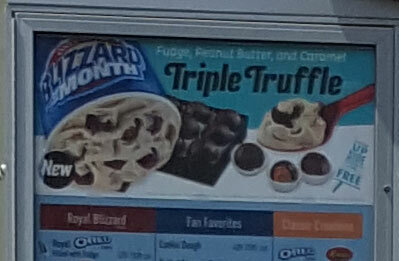 [New BotM for August 2017, returning BotM for January 2018] The Blizzard of the Month is the Triple Truffle blizzard and I joked that it was just the candy shop blizzard, part two. They've swapped out hazelnut truffles for peanut butter truffles, and now it's chocolate sauce instead of chocolate softserve, but other than that, it seems to be the same idea. Why can I never get a photogenic blizzard? Well looking back at my candy shop blizzard review, I see that we've gone from cube truffles to mini cup truffles. Nothing wrong with that. To summarize, this blizzard is more about #funfactor than it is about being unique. Getting at least one truffle per bite is always going to be fun. That said, I keep thinking I taste cheerios. The peanut butter truffle is the only flavor that really stands out (against a light chocolate flavor in the background) but for whatever reason, it combines with everything and reminds me of cheerios. I know this sounds crazy, but it is what it is. 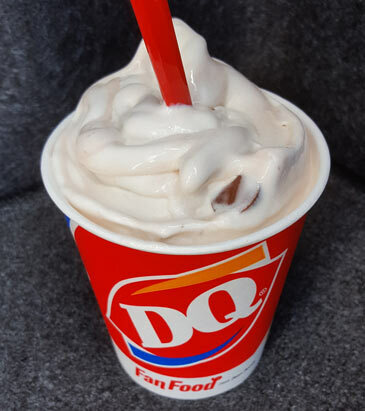 So, simple blizzard. Tons of truffles buried in a light chocolate base. I enjoyed it. No need to rush out for this one, but no reason to avoid it either... unless you hate cheerios. Ok, someone else try this and let us know your thoughts.